PMS Color Logo Ribbon Archives - ThirtySevenWest ThirtySevenWest - Creative ideas about personalized custom ribbons, woven tags and labels, personalized gifts and more!!! Pantone Matching Custom Ribbon Service is now available for your branding! Our Pantone Matching Custom Ribbon is available in 5/8″, 7/8″, and 1 1/2″ in beautiful single and double face Satin! Each custom order is quoted based on the quantity of yards, width, logo, etc. Your order will be placed in the Tier based on your needs. Please fill out the form below Today! We will contact you shortly with a Quote for your Pantone Matching Custom Ribbon Order! Free Graphic Layout Prior to Production. Once we receive your order we will produce a graphic layout, based on the details of your order, and email it for you for approval before production is started. Order your Pantone Matching Custom Ribbon now or contact us with any questions! Custom ribbons aren’t just a creative way to add some razzle dazzle to a birthday party, wedding or gift bag. They’re tried-and-tested marketing tools that boost brand recall, engage audiences, add aesthetic and sentimental value to a product, and make a lasting impression on your audience. Our satin ribbon is made from fine polyester fibers to closely resemble the appearance of silk, hence its association with “luxury”. However, modern satin ribbons are usually made from more cost-effective synthetic materials like polyester and rayon, which are able to deliver a similar glossy sheen that you often find in silk ribbons. 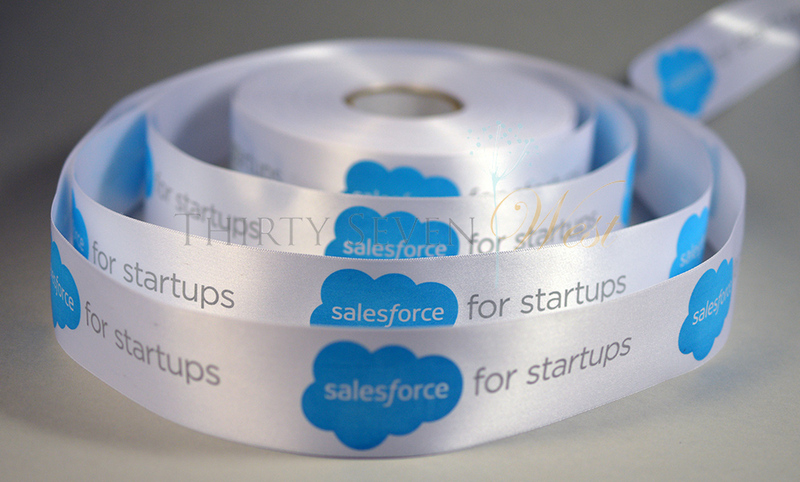 The light-reflective texture of satin gives the ribbon that unique “shine” to make your logo pop. Also known as the Swiss double-faced satin, matte textured ribbons are elegant, understated and excellent at holding their shape. Similar in texture to a cotton ribbon, but with a similar quality to a satin ribbon, matte ribbons pair seamlessly with metallic prints, and looks particularly stunning with a gold and silver logo design. What’s not to love about GLITTER? Simply emboss your logo on it and add some sparkle to a humdrum package, giveaway or gift bag—and voila! Completely opposite to the aforementioned glitter ribbon is the more understated and modest grosgrain ribbon with a unique ribbed appearance. This is a firmer and more durable fabric that’s excellent at holding its shape.